Dahlias, Dahlia variabilis, are a popular addition to the landscape because they have a wide height range (1 to 6 ft) and a variety of flower shapes and sizes (2 to 12 inches). Color range includes orange, pink, purple, red, scarlet, yellow, and white. Some flowers are striped or tipped with a different color. Dahlias begin blooming in early summer and continue to frost. Flower production may slow with high summer temperatures and moisture stress. Dahlias can be started from dormant tuberous roots, grown from seeds, rooted from cuttings, or purchased as transplants. 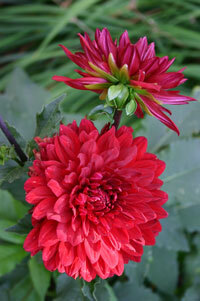 Because dahlias are hybrids, plants grown from seeds do not completely grow true to type. To ensure cultivar consistency, buy tuberous roots of named cultivars and save the tuberous roots from year to year. Dahlias are classified according to flower shape and arrangement of petals. Single-flowering dahlias have one row of petals, generally grow to 3 ft or less, and have flowers 4 inches or less in diameter. 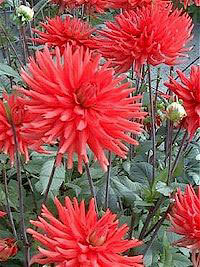 Types of single-flowering dahlias include: singles, orchid-flowering, anemone, and collaretts. Single-flowering dahlias have a ring of evenly spaced petals. Orchid-flowering dahlias are similar to single-flowering types, but the ray florets curl up along the edges. Anemone flowers have an extra ring of small petals. Double-flowering types have multiple rows of petals, grow taller, and have large flowers. Double-flowering types are also classified according to flower size and shape. Cactus dahlias have somewhat tubular shaped petals that curve backwards for over one-half of their length. Semi-cactus dahlias resemble cactus types but the petals are broad at their base and curve for less than half their length. Incurved cactus cultivars have petals that curl strongly towards the center of the flower. There are two types of decorative dahlias: formal and semiformal. Formal decorative types have broad, regularly arranged, pointed or rounded petals that curve back towards the stem. Informal decorative dahlias have long, irregularly arranged, often twisted petals. Ball dahlia flowers are usually 3 1/2 inches in diameter and ball shaped or slightly flattened. The quilled petals are blunt or rounded at the tip. Pompons are smaller version of ball dahlias with flowers less than 2 inches in diameter. Dahlia tuberous roots should be divided before they are planted in the spring. The best time to divide is after the eyes have sprouted and the new growth is no more than an inch in length. The new shoots are tender and easily broken, so handle gently. Cut the clump into individual tuberous roots with a sharp knife. Each tuberous root must have at least one eye (growing point) or sprout to produce a new plant. Eyes are found where the tuberous root and the stalk of last season's plant join. If it is difficult to distinguish the dormant eyes, place clumps in a warm moist place for several weeks or plant in shallow trays to promote sprouting. Cut surfaces should be allowed to dry for several days or dusted with captan or sulfur before planting. Select a sunny (minimum of 6 hours) location protected from strong winds. Dahlias grow best in a deep, fertile, well-drained soil with a pH of 6.0 to 6.5; they are not tolerant of water-logged soils. Incorporate 2 to 4 inches of organic matter such as compost, pine bark, or well-aged manure and 2 to 4 lb of 8-8-8 or 10-10-10 per 100 ft2 (2 to 4 Tbsp per ft2) before planting. Dahlias are very sensitive to freezing temperatures. Large tuberous roots may be planted about 2 weeks before the last spring frost date. Small tuberous roots and transplants should not be planted until all danger from frost has passed. Spacing between plants depends upon the cultivar and method of growing: rows, beds, or borders. Large-flowering dahlias should be spaced 3 to 4 ft apart; smaller dahlias can be spaced 2 ft apart. Dig a hole 8 to 10 inches deep and wide enough to accommodate the tubers. Loosen the soil in the bottom of the hole and refill to a depth of 6 inches. Set the tuberous root on its side, with the eyes facing upward. Cover with 2 to 3 inches of soil. Soil should be filled in around the plants as they develop until the surface is level. Many gardeners insert a stake at the side of each hole at planting for future support. Summer Care Apply a 3- to 4-inch layer of mulch using either compost, pine straw, or pine bark. Dahlias are heavy users of water; keep the soil moist but not saturated. Each tuberous root usually produces multiple shoots. While you can leave all the shoots to grow, thinning will produce flowers of higher quality. Leave one to four of the strongest shoots. When plants are about a foot tall and display 3 to 4 pairs of leaves, pinch out the terminal shoot to encourage branching. One pinching is sufficient for most dahlias; small growing types can be given an additional pinching. 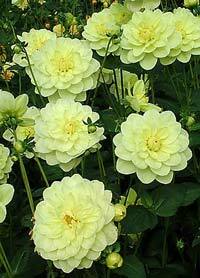 Tall-growing dahlias should be staked to support the long stems and large flowers. Begin staking when the plants are about a foot in height. 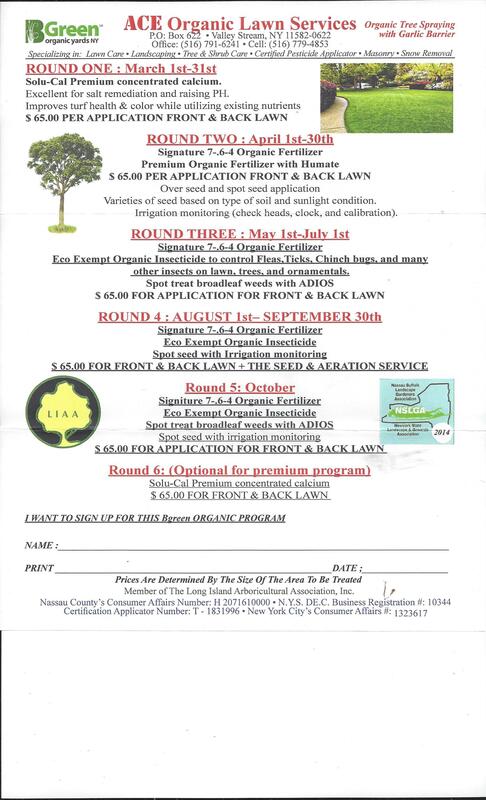 Fertilize monthly with a water soluble fertilizer or apply 2 to 3 lb of 5-10-10 or 10-10-10 per 100 ft2 (2 to 3 Tbsp per ft2) in July. Excessive nitrogen can result in foliage production at the expense of flower production. A second application may be needed on sandy soil or during rainy seasons. Flower size can be increased by removing lateral flower buds (referred to as disbudding). When the three buds that form at the end of each branch reach the size of small peas, remove the two side buds. Small-flowering types should not be disbudded. Faded flowers should be removed to encourage continuous blooming. Check plants on a regular basis for diseases, insects, and other pests. The most likely pests are aphids, spider mites, leafhoppers, thrips, and European corn borer. Disease problems include tuber rots, ring spot, vascular wilts, mosaic virus, powdery mildew, and botrytis blight. Disease problems can be reduced by following recommended cultural practices and by providing good air circulation. Remove or treat affected plants or plant parts when first observed.